Toronto, Ontario – Starvox Entertainment presents the Canadian Tour of London’s West End hit POTTED POTTER: The Unauthorized Harry Experience – A Parody by Dan and Jeff. Written and created by two-time Olivier Award-nominated BBC Television actors Daniel Clarkson and Jefferson Turner, limited engagements will run across Canada from September 24 –December 31, 2016. POTTED POTTER is perfect for ages six to Dumbledore (who is very old indeed). Playing to sold out houses all over the world, POTTED POTTER takes on the ultimate challenge of condensing all seven Harry Potter books (and a real life game of Quidditch) into 70 hilarious minutes. This fantastically funny show features all your favorite characters, a special appearance from a fire-breathing dragon, endless costumes, brilliant songs, ridiculous props and a generous helping of Hogwarts magic! Starvox Entertainment and Potted Productions introduced the hilarious show to North American audiences in Toronto at the Panasonic Theatre in 2012. After a record-breaking run in Toronto, POTTED POTTER headed to New York City and played a hit, off-Broadway run at The Little Shubert Theater, (the show has since returned to both cities as part of its third record-breaking North American tour). This Monty Python-esque show has also sold out theatres across London, Edinburgh, Australia, New Zealand, Singapore and Dubai. Whether you plan on camping outside a bookstore for three days awaiting the release of Harry Potter and the Cursed Child, or you don’t know the difference between a Horcrux and a Hufflepuff, the comedy, magic and mayhem of Potted Potter makes for a fun and funny visit to the theatre. My family are crazy Harry Potter fans and as soon as I saw that this show was coming to town, I knew we had to go see it. 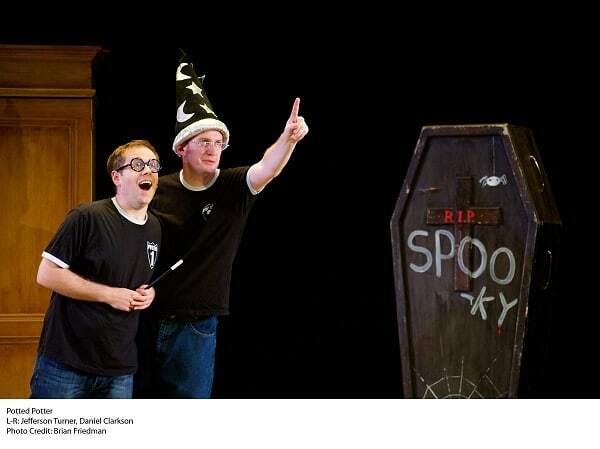 If you are wondering if Potted Potter is coming to a city near you, make sure to check out the Tour Dates on the Official Potted Potter website. I am super excited to announce a giveaway for 2 tickets to the Vancouver, BC Canada showing of Potted Potter on December 23rd, 2016 at 730 pm at The Vogue Theatre. This giveaway is open to residents of the Lower Mainland and Fraser Valley of BC, Canada who are over the age of 18. Prize is for the pair of tickets and does not include transportation or any costs associated to attending the performance. Please ensure that you read the full terms and conditions found at the bottom of the entry form. Favourite character has to be the loveable friendly giant, Hagrid! Favourite character had to be the loveable friendly giant, Hagrid! My favourite Harry Potter movie has to be the original one! That one was the first one that started all the magic!